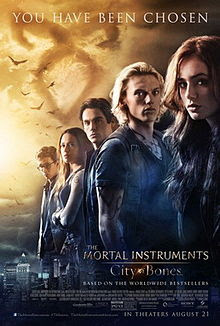 I was super excited to find out that I had won a pair of tickets to watch "Mortal Instruments - City of Bones" via HVN Entertainment (thanks guys!) so yesterday, I headed over to watch the screening with Siew Mai. I have read the book (only this particular one) and was extra excited because Godfrey Gao and Jonathan Rhys Meyer are in the movie!! For those who do not know about the books, you can read the wikipedia version here. It may be a little confusing but at least you get a gist of the novels. After watching the movie, I was rather disappointed. Sure, the visuals were stunning but a beautiful set and wonderful visual effects cannot beat a seamless script. The movie took too much liberty with the book and the end result was a choppy series of scenes that were disjointed. Siew Mai has never read the books and she said that the movie did nothing to convince her to start reading them. In fact, the opposite is true. I do understand that it's necessary to shorten the book into a 2 hour film but there's where excellent scriptwriters show their prowess. The cheesy lines and the jarring insertion of lines from the books really didn't help. I was also a bit disappointed with Gao's portrayal of Magnus although Siew Mai thought that it was campy enough. To be fair, I felt that Gao couldn't portray a better Magnus because of his lines in the party scene and not that he's a lousy actor. I'm glad that I didn't pay good money to watch it but I have a feeling that I will pay to watch the sequel. It's what fans of the books will do!